Are you serious about looking after your hair? If the answer is Yes, then the following article is a must read. Although a good Shampoo, Conditioner, Hair Oil and Heat Protector are important to have in the bathroom cupboard, your kitchen cupboard is just as important. Here are 7 foods that will seriously change the condition of your hair and in turn will also lead to a healthier diet. Eggs are rich in biotin, a B vitamin essential for hair growth and overall scalp health. You have most likely heard about it on a shampoo commercial or read a magazine article that recommended biotin supplements. Because our bodies make their own biotin in the intestines, and it is plentiful in many common foods, deficiency is very rare. But in those few cases in which people are very ill and don’t have use of their intestines, biotin deficiency causes hair loss. So yes, biotin is important for hair health, but you don’t need to take supplements. Just eat a balanced diet that includes some high-biotin foods: eggs, peanuts, almonds, wheat bran, salmon and avocados. The mineral zinc is involved in tissue growth and repair, and that includes hair growth. It also helps keep the oil glands around the hair follicles working properly. Low levels of zinc can cause hair loss, slow growth, and dandruff. But the amount you get from eating foods rich in zinc such as oysters, crab, clams, liver, lean beef, most nuts and seeds, peanut butter, wheat germ, fat-free yogurt, and cheese are plenty to keep your hair gorgeous. Beta-carotene in foods is converted to vitamin A in the body, and vitamin A is necessary for all cell growth, including hair. A deficiency can lead to dry, dull, lifeless hair and dry skin, which can flake off into dandruff. Be aware that you can have too much of a good thing when it comes to vitamin A: Too much can cause hair loss. My advice is to add more beta-carotene-rich foods like sweet potatoes, carrots, kale, butternut squash, dark green lettuces, asparagus, and pumpkin to your meals rather than take vitamin A supplements. Red, yellow, and green bell peppers are a colorful, delicious source of vitamin C, which is necessary for hair health for many reasons. Besides helping the body use non-heme iron (the type found in plant foods) to ensure that there is enough iron in red blood cells to carry oxygen to hair follicles, vitamin C is also used to form collagen, a structural fiber that helps our bodies (quite literally!) hold everything together. Hair follicles, blood vessels, and skin all require collagen to stay healthy for optimal growth. Even minor vitamin C deficiencies can lead to dry, splitting hair that breaks easily. Along with tofu, soybeans, starchy beans, and black-eyed peas, lentils are a great vegetarian source of iron-rich protein, which we recommend for two reasons. First, protein is necessary for all cell growth, including hair cells. Hair gets its structure from hardened proteins called keratin. Without enough protein for keratin, hair grows far slower, and the individual strands that do grow are weaker. Second, the iron found in animal foods (called heme iron) such as lean beef, turkey, chicken, or pork is more easily absorbed by the body than the iron in plant foods (non-heme iron). So, if you are a vegetarian, it’s especially important to fill your plate with the most iron-rich plant foods. Additionally, you should combine your iron-rich vegetables with foods high in vitamin C, because vitamin C improves the body’s ability to absorb non-heme iron. Pork Tenderloin is rich in B vitamins, folate, B6, and B12. These vitamins are involved in the creation of red blood cells, which carry oxygen and nutrients to all body cells, including those of the scalp, follicles, and growing hair. 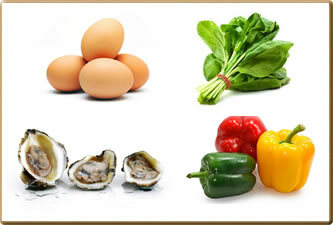 Without enough B vitamins, the cells can starve, causing shedding, slow growth, or weak hair, which is prone to breaking. Not a fan of pork? Wild salmon (fresh or canned), shellfish, beans, chicken, oatmeal, eggs, peanut butter, fat-free and low-fat dairy foods and fortified whole-grain cereals are also good sources of B vitamins.